The Silver Springs Nature Theme Park covers 350 acres and is one of the oldest theme parks in Florida bringing glass-bottomed boat trips to Florida as far back as 1878. 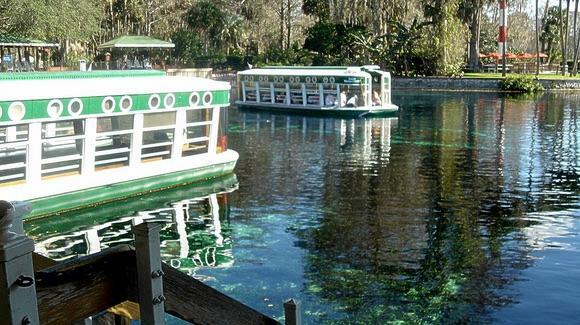 In January 2013, it was announced that Silver Springs would revert back to a State Park on October 1, 2013. It is situated near Ocala, about 90 miles northwest of Orlando and forms part of the Silver River State Park. The artesian springs produce an unbelievable 550 million gallons of water every single day which flow into the Silver River which in turn flows into the Ocklawaha River which eventually becomes part of the St. Johns River system flowing into the Atlantic. As well as the boat trips, you can also see native animals on the Wilderness Trail Ride by safari Jeep through the forests plus there are a number of animal exhibits including the rare “swamp ghost” white alligators, native snakes, the western cougar and one of the world’s largest collections of bears. If you tire of the wildlife then there is a botanical gardens, rides, a children’s play area and an outdoor theatre where you can see a free-flight demonstration of birds including raptors. No park would be complete without shopping and restaurants and Silver Springs is no exception. The open-air Springside Mall has a range of shops selling a wide variety of merchandise. There are a number of food outlets including a pizzeria, cafe, deli and an ice cream and fudge shop. There are also snack bars and food carts dotted around the park. On special events, the Billy Bowlegs Bar & Grill is open. You can buy a single day admission ticket which includes admission to any daytime special events or concerts. If you plan on making several visits during the year, then it might be worth considering the Silver Pass which gives you a full year of admission to both Silver Springs and Wild Waters plus free parking. Your ticket also admits you to any special events or concerts. Silver Springs are currently offering a “buy one day, come back all year” deal which gives you a Nature Card with admission for a full year to Silver Springs except on concert and special events days. Throughout the year, Silver Springs puts on a number of events including Halloween and Christmas plus music concerts at the Twin Oaks Mansion Concert Stage, especially country music singers. Admission is free to pass holders and guests with a normal one day admission ticket. Silver Springs can trace its tourist roots right back to the 1860s when steamboats brought tourists up the Silver River. A few years later, the idea of a glass-bottomed boat was built to give visitors views of the crystal clear waters and springs. The clear waters have also attracted television and film companies looking for underwater locations and many different films, TV shows and advertisements have used Silver Springs including six of the early Tarzan films featuring Johnny Weismuller, Creature from the Black Lagoon, Rebel Without A Cause and the James Bond films Thunderball, Moonraker and Never Say Never Again. To prevent the park from being redeveloped into housing, it became a State Park in the 1980s. Silver Springs Nature Theme Park was run by Palace Entertainment (up until September 30, 2013) who operate a number of parks in the United States including Silver Springs sister park next door, Wild Waters. Wild Waters is a water park with a wave pool, a number of flume rides and children’s pool area. Also operated in Florida is the water park, Big Kahuna’s in Destin plus the Boomers Family Entertainment Centers at Boca Raton and Greater Ft. Lauderdale. Palace Entertainment is in turn owned by the Spanish company, Parques Reunidos who operate over 50 theme parks worldwide. Silver Springs Nature Theme Park is on S.R. 40, just east of Ocala, about 90 miles from Orlando.